A little over a week ago, the International Agency for Research on Cancer (IARC) announced that glyphosate would be added to their list of agents that are “probably carcinogenic to humans.” Glyphosate wasn’t the only pesticide added to the list, but as Nathanael Johnson noted at Grist, glyphosate tends to be something of a lightning rod due to its association with genetically engineered (Roundup Ready) crops. Let me start by pointing out I’m pretty late to the party writing about this. The IARC is a well-respected agency within the World Health Organization, so this announcement has been widely reported. And it should surprise nobody that Monsanto is vehemently denying any health concerns, while the usual suspects who oppose GMOs and pesticides are using it to advance their agendas. I think the aforementioned piece by Nathanael Johnson at Grist and a piece by Dan Charles at NPR do a good job of putting this new classification into context. Grist also posted a really cool video that explains what the IARC group 2A classification (“probably carcinogenic to humans”) actually means. Rather than simply re-state what others have said on the topic, I wanted to actually take a thorough look at the evidence supporting this classification. I work with pesticides (especially glyphosate) on a regular basis, so I take this classification very seriously. If glyphosate is indeed likely to cause cancer, I am in the group of people who is most likely to be affected. As most of the reasonable write-ups have previously noted, IARC group 2A agents are problematic mostly for occupational exposure; that is, people who work with (or around) the chemical on a regular basis over a long period of time. The general public is highly unlikely to see any ill effects from any agent with this classification based on available evidence. I’m disappointed that IARC decided to announce the classification about a year before they plan to release the full monograph that details their reason for the decision. Having their list of references sure would have been useful to determine which data they’re using to come to that conclusion. So I did a literature search for studies that included glyphosate and cancer. A recent review article by Pamela Mink et al. (2012) provided a nice starting point. It should be noted that the review article was funded by Monsanto; however, I didn’t actually rely on the conclusions of the Mink paper, so that potential conflict is mostly irrelevant. I simply used the Mink article as a starting point to find research articles that investigated the link between glyphosate and cancer. 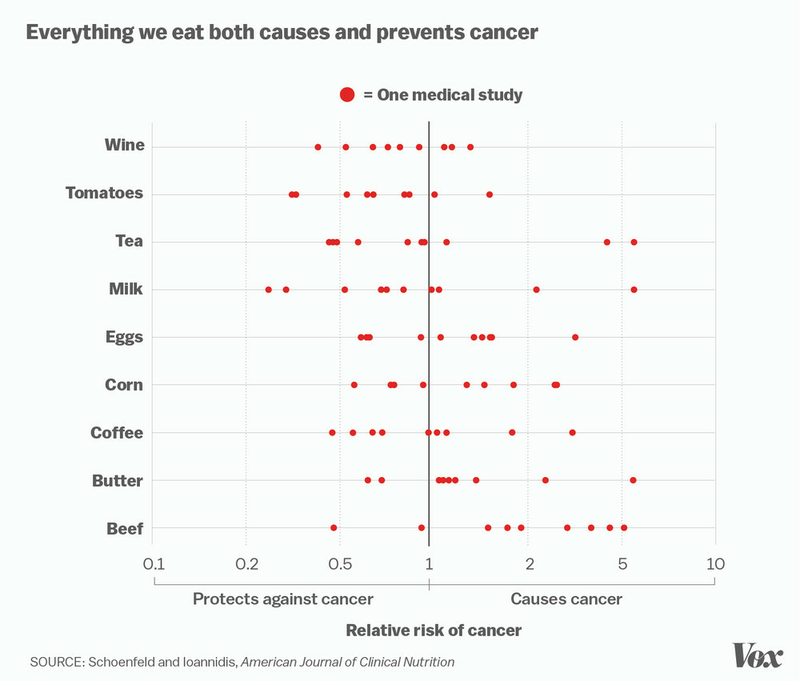 Recently, Vox presented a very nice figure that summarized why you shouldn’t put too much faith in any single study about things that cause or cure cancer. 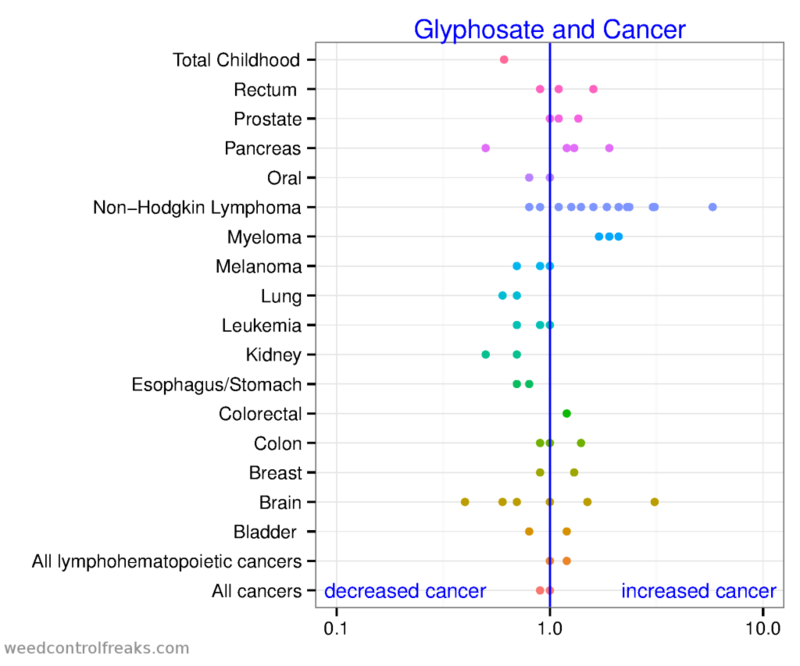 I used that as a model to create this figure, which summarizes all of the information I could find relating glyphosate exposure to cancer. Additionally, in the case control studies I read, a very small minority of NHL cases were actually exposed to glyphosate. For example, only 97 people (3.8% of the study population) had been exposed to glyphosate in the DeRoos (2003) study. Similarly, only 47 people (2.4% of the study population) had been exposed to glyphosate in the Eriksson (2008) study. These are very small numbers. To look at it another way, only about 3% of the NHL cases in most of the case control studies had actually been exposed to glyphosate. So even if glyphosate does increase the risk, it certainly is not a major contributor to NHL cases in the general population. But case control studies aren’t the only types of studies that have been used to investigate the link between glyphosate and cancer. DeRoos et al. conducted a follow up to their 2003 study using a different, and arguably better methodology. Cohort studies follow a group of people during some portion (or all, depending on the study) of their lives, and track many risk factors and health outcomes. DeRoos et al. (2005) looked at a group of 54,315 agricultural workers. 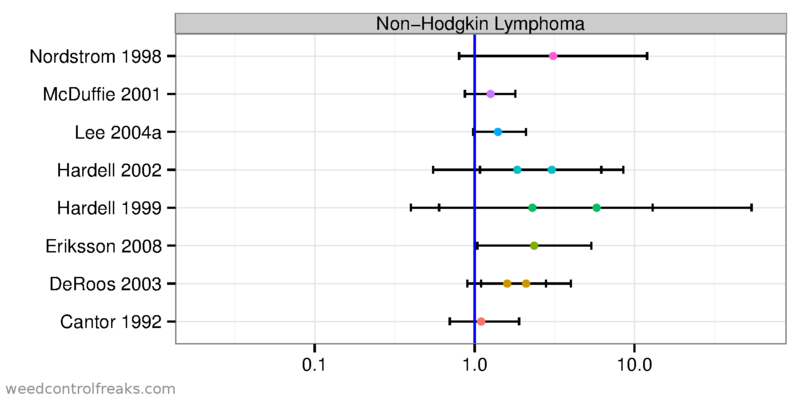 Once again they used two different models in their analysis, but the results of this study were contrary to what was observed in the case control studies.